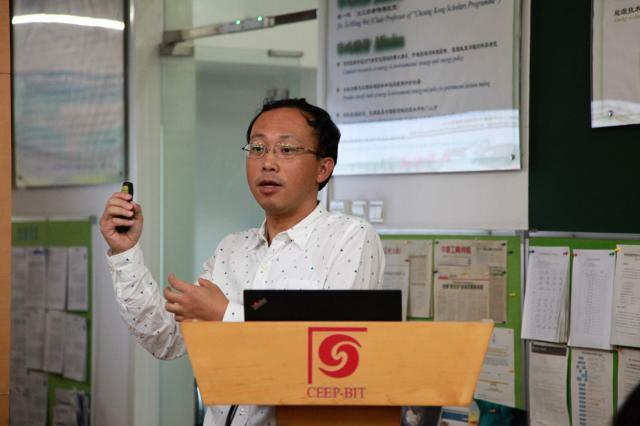 At 10:00 on September 3, 2018, Prof. Chien-Chiang Lee of National Sun Yat-sen University was invited to visit CEEP and do an academic report entitled “Energy Commodity Futures, Country Risk, and Financial Uncertainty”. This report was hosted by Prof. Yu Hao, many teachers and students attended the report. Professor Chien-Chiang Lee is a full-time professor in the department of finance,National Sun Yat-sen University. His research areas include energy economy, economic growth, financial markets and institutions, and applied metrology. Professor Lee serves as the editor group of many international academic journals, including deputy editor of Energy Economics, international editor of Energy Journal and editor of Business and Economics Journal. Professor Lee has won a number of academic honors: Marquis Who 's Who, Albert Nelson Marquis Lifetime Achievement Award, 100 people plan for high-level talent in Shanxi Province plans, visiting scholars at the university of Texas at SAN Antonio, research program for outstanding young scholars of the ministry of science and technology, 《Marquis Who’s Who in the World (2016)》, Mr Lui fung cheung memorial medal (management science society of the republic of China), special talents awarded by the ministry of science and technology. According to the Ecological Economics survey, he ranks the first in the 21st century in environmental resources and Ecological Economics (a total of 6,597 papers).He ranks top 5% of Taiwan economists among IDEAS log-in scholars. Professor Lee has published a number of high-quality papers in prestigious international journals, including Journal of Money, Credit and Banking, and Journal of financial and economic A.Quantitative Finance, The Geneva Risk and Insurance Review, The European Journal of Finance,The Journal published in the class A of Economics is Macroeconomic Dynamics, etc., and the Journal of Energy includes Energy Journal, Energy Economics, Resource and Energy Economics, Energy Policy, etc. He has published over 150 papers (SSCI). Professor Chien-Chiang Lee shared his experiences in the research, and then, introduce a recent working paper for us. Using an innovative instrumental variable quantile regression technique, this paper assesses whether and how country risk and financial uncertainty exert an impact on energy commodity futures prices (crude oil, heating oil, and natural gas) under different commodity conditional return distributions over the period from January 1994 to July 2017. To gain further insights into this issue, we also discuss whether the correlations change with different dimensions of country risk, i.e., economic, financial, and political, which extant studies have ignored. The results reveal that country risk and financial stress do have a significant impact on energy commodity returns of futures contracts with different maturities, but their direction, intensity, and significance differ, caused by the distinct market situations and divergent channels of country risk. These factors are useful indicators for forecasting future returns in financial and commodity markets and can help evaluate and implement trading activities, hedging strategies, and portfolio construction. These results are important for policy makers who should be cautious when formulating a strategy for macroeconomic stability.